You can assign tutors to the group. They can add new members. Group members can submit portfolio pages for feedback / assessment. These pages are locked until released by an administrator or tutor. The site administrator can limit the creation of groups to users with staff and / or administrator rights. If you cannot create a group, you will most likely not have the appropriate permission and will have to contact your site administrator, e.g. via the Contact us form to enquire about the process of having a group set up. 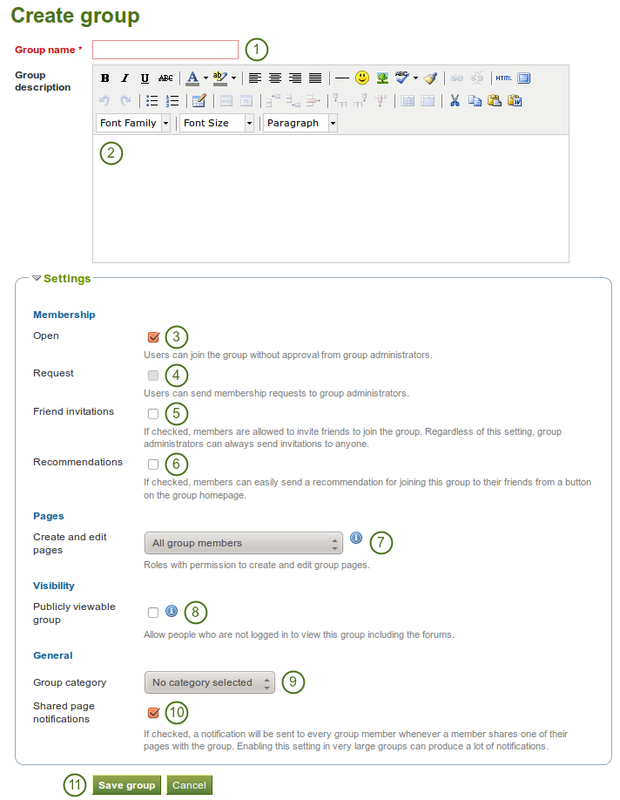 Open: Create an open membership group if you want users to join the group without approval from group administrators. Request: Create a request membership group if you want user to send membership requests to group administrators. Open and request membership groups are mutually exclusive. Friend invitations: Check this box if you want to allow members to invite friends to join the group. Regardless of this setting, group administrators can always send invitations to anyone. Recommendations: Check this box if you want to allow members to send a recommendation for joining this group to their friends from a button on the group homepage. Friend invitations and recommendations are mutually exclusive options. Publicly viewable group: Choose this option if anybody shall have access to this group. You only see this setting if the site administrator allowed you to have it. Anybody can see the group homepage and the discussion forum. Depending on the membership visibility, they may also see group members. Only members of the groups can see the group’s pages, unless they have been made public, and the files area. Group category: Choose a category if you want to associate your group to one, allowing you to filter groups on the My groups and Find groups page according to categories. This setting is only available if the site administrator turned it on. Shared page notification: This check box has a check mark per default. Whenever somebody shares a page with the group, all group members receive a notification. You may want to uncheck this setting in very large groups where lots of pages are shared but members do not have to be notified. Allow submissions: Use this option to allow group members to submit pages for feedback / assessment. These pages and a number of artefacts in them are locked until released by a group admin or tutor. 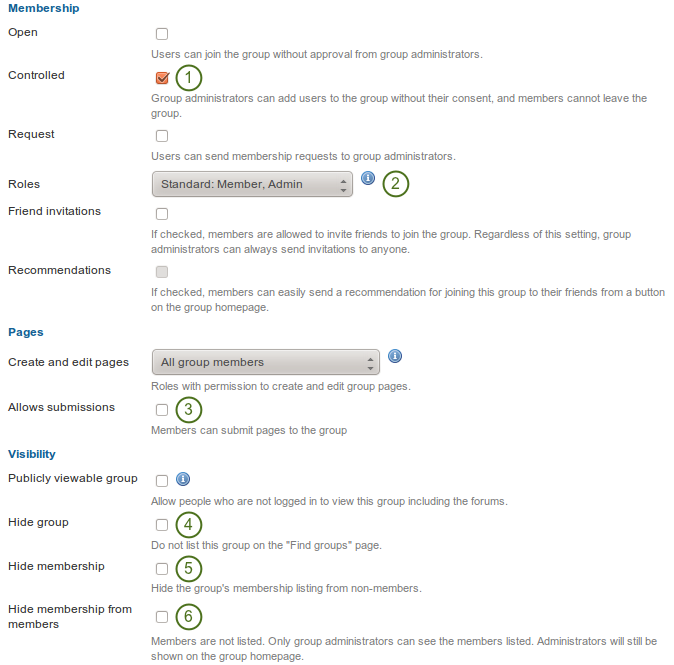 When you have site administrator rights, you have yet another additional setting when you create a group: You can choose to add new users to a group automatically. That way, any new user on the site becomes a member of this group. This is a great setting when you want to set up a community group which all users should join in order to participate in forum discussions etc. On mahara.org this is used to make every user a member of the “Community” group in which discussions around Mahara take place. You can change the group type to a different one. Please be careful if you do so especially from a controlled course group. If users have submitted portfolio pages to that group, they remain locked when you change the group type.